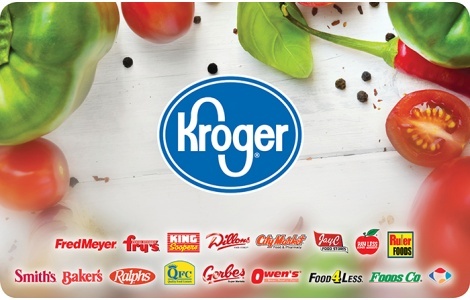 The Kroger Co. Family of Stores spans many states with store formats that include grocery and multi-department stores, discount, convenience stores and jewelry stores. We operate under nearly two dozen banners, all of which share the same belief in building strong local ties and brand loyalty with our customers. Protect this card and treat it as you would cash. For card balance, check your sales receipt, visit www.gcbalance.com, call 1-866-822-6252, or use your Kroger Family of Companies’ mobile app. Use of this card constitutes acceptance of the terms and conditions of this Gift Card. This card represents a prepayment for goods and fuel available at Kroger, Baker’s, City Market, Dillons, Food 4 Less*, Foods Co., Fred Meyer, Fred Meyer Jewelers, Fry’s Food and Drug, Gerbes, JayC, King Soopers, Littman Jewelers, local mkt, Main & Vine, Owen’s, Pay Less Supermarkets, QFC, Ralphs, Ruler Foods, Smith’s Food and Drug, Turkey Hill Minit Markets, Kwik Shop, Loaf ‘N Jug, Quik Stop, Tom Thumb Food Stores**, and Turkey Hill Experience. The card cannot be used for lottery, money orders, Kroger Co. gift cards, or other products prohibited by law. The card cannot be exchanged for cash, except where required by law. Reload this card at any of our stores’ cash registers to add additional value. If your card is lost, stolen, damaged or destroyed, it will not be replaced and the value remaining lost. Funds do not expire. No fees. Issued by The Kroger Co., an Ohio corporation. *Good at Food 4 Less stores in So. CA, IN and IL only. **Good at Tom Thumb Food Stores in AL, FL, MS and TN only.